Growing up in the Northwest, I've owned my fair share of pullover hoodies. Heck, sometimes that's all you'll find in my closet. Though they're not waterproof, the rain never seems to fully soak through the impenetrable comfort of the hoodie. You can always tell who the transplants are, too, because during the 11 months of rain up here, they're the only ones with umbrellas. 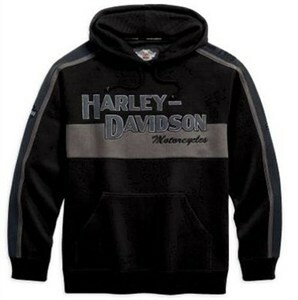 Whether you're the type of person that wants to embrace the Northwest weather in your own state, or you just love the comfort that pullovers give, Harley-Davidson puts their seal of approval on this one. Besides having the Harley-Davidson Eagle logo on the tag, it has a nice applique graphic on the front that isn't going to come off in the washing machine. It's made out of 80 percent cotton and 20 percent polyester sweatshirt fleece for the most part, and the hood has a 100 percent cotton thermal liner to keep your noggin toasty and warm. The sleeves themselves have patches of contrasting color detail that flows from the shoulders to create a nice break in the solid black. A nice big kangaroo-style pocket is located in the front -- keep your hands warm, or load it up with goodies to munch on later. The hood has a nice drawstring in it, too.